It drives me nuts when I’m at a concert and in the middle of a song the performer breaks the mood to introduce somebody or do a joke. The songwriters worked hard to craft a song that had a certain story or evoked a certain emotion, and the singer destroys it by blurting out “my new CD is in the lobby!” or "on piano -- the King Kong of the Keyboards -- Mr. Lester Spork!" A prime offender of this was Sinatra during the ring-a-ding Rat Pack era. No one was ever better at interpreting songs than Frank Sinatra. Yet put him on stage with a drink in his hand and he suddenly became the Kingfish. He’d respectfully credit the songwriter then in the middle of “Eb Tide” break into an Amos & Andy voice and slander Sammy Davis. Sure you should introduce your band and backup singers and fog machine operator but not in the middle of “Unchained Melody.” Lyrics are not just words you sing between racial slurs. What if actors followed this practice during plays. George: You can sit around with the gin running out of your mouth; you can humiliate me; you can tear me to pieces all night, that's perfectly okay, that's all right. Martha: You can stand it, you married me for it! Ladies and gentlemen, Buster Ignatz, our Art Director! How about these costumes? Ladies and gentlemen, Ruth Schmegegy and the gals from the shop! The television equivalent is Pop-Up videos. As an “experiment” they employed them one time during an episode of ABC’s SABRINA THE TEEN WITCH. Sabrina: Aunt Hilda, I’ve done all I can do, period. BLIP: Melissa Joan Hart’s first period came six days after her 13th birthday. And it extends even beyond TV. This is a true story. I was at a bachelor party for a member of CHEERS. Two women strippers were engaging in some very fine girl-on-girl action when one turned to us and said, “So you guys write CHEERS? How does that work? Does one person write the whole script or do you each take characters…?” Needless to say, all the flags were lowered to half-mast. Anyway, you get the idea. Just sing the song. Or suckle her breasts. Again, it’s a matter of respect for the writers. Thank you. This is a repost from five years ago. I'm still ranting. At least they weren't asking you to read one of their scripts. It remains a mystery to me as to why many men find "girl-on-girl action" exciting. And yes, I'm a guy. I know what you mean, Ken. It used to annoy me no end when DJs would talk over the first 30 seconds of a song. Or break in just before the song ended. Good rant. Well, I'll just get right to it. Ken, were you ever kicked by an actor/director? After awhile your cast starts getting bored playing the same characters and you can see that in their performance. I suspect for the singers, if they're doing a concert every night or two on the road or two shows nightly in Vegas, interrupting the song becomes no big deal because they've sung the thing so many damned times and they're bored with singing it straight through again. So ad-libbing introductions or sticking a sales pitch into the middle of the thing is the way to keep up their own interest. Obviously, if you're the poor schlub who just shelled out $200-$500 for two tickets to hear the signer/band whose music you love, you don't want to hear about the keyboardist they love or a Ron Popeil-like infomercial in the middle of the number. But if the singer is successful enough he/she doesn't have to care what you think, and you're only recourse is to know going in your featured artist might not stick to what you're paying him to do. Was Phoef Sutton at that party? His typical expression looks like he just heard that stripper's comment. Daisy: Why do you drive a minivan? Do you have kids that we don’t know about? Angela: I’m an artist, Daisy, and the Sienna has plenty of room, plus I stink at parallel parking and that back-up camera thing is like the invention of the century. Oh, wait. That really happened. My guess is that because they were completely bored with their act they assumed the audience was too. "So you girls are strippers. How does that work? Do you get tipped more if a customer soils their underwear during a lap dance? Did you go to college for this job? How do you deal with getting a guy off when you feel he's repulsive?" Oops. The comment by "d" is by me. When I was a kid, my parents took my sisters and I to see "Hello Dolly" starring Pearl Bailey and Cab Calloway. Part way thru the big finale, Ms. Bailey stopped the show dead in its tracks and made a joke. She then proceeded to do about 15 minutes just being Pearl Bailey; telling stories, talking with audience members, and even getting Cab Calloway to do a little bit of "Minnie The Moocher". The audience loved it! The cast seemed to enjoy it. And Pearl Bailey seemed to be having genuine fun. When she was done, she looked around the stage at the cast and said, "Alright, where were we?" And BOOM, back to the number. Sure, it was planned. But it came off as spontaneous and it might not have been quite the same each performance. And it was a highlight of a show full of highlights. I saw the second to last performance Frank, Dean and Sammy did together. Sammy opened in a solo set, followed by Dean's solo set. After intermission, Frank performed solo. 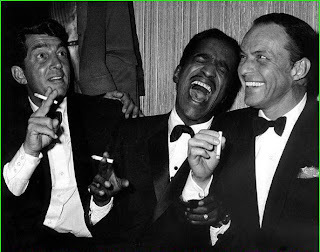 Then the last half-hour or so was all three on stage together, delivering the Rat Pack shtick. But they all got to do their most popular songs interruption free. I couldn't agree more, Ken. The performers have to remember that the audience--and have I mentioned my novel, LOVE, DEATH, AND THE TOYMAN, by Robert S. Napier--is available on Amazon for only $3.00 (Kindle edition)--hasn't heard this song 500 times. I normally agree with you on everything...except this. When you listen to or see old videos of Sinatra and the Rat Pack, those ad libs and that off the cuff energy was part of the magic of those people, those shows and that era. And from where I sit, these guys were always at the party that I wanted to be at. Remember, it's a cuckoo world, man...let's grab some chicks and fly all night long. This is exactly the reason I hate concert albums. I could listen to Sinatra or Streisand, etc., studio recordings all day but then some of the live "ad-lib" or just talking stuff can be cringe worthy...and we have to listen to it every time. And (referring back to the "Hello Dolly! "/Pearl Bailey story)I saw Zero Mostel in "Fiddler". What should have been a magical night was ruined by Zero stopping the show, looking out into the audience, pointed to some random person and asked how she got such a good seat. The audience thought this was hilarious but for me and my date the show was over. I heard that Zero would pull this kind of stuff often after he got bored with a role. I saw Danny Kaye (in "Two By Two") pull this same crap. The stripper(s) incident sounds somewhat similar to what happened at Frasier Crane's bachelor party when the stripper turned out to be one of his patients. And if I'm not mistaken, did't Ken Levine & David Isaacs write that episode? I couldn't help but wonder if it's just a coincidence or if the real-life bachelor party incident was inspiration for that scene. Regardless of what inspired it, that is an absolute classic. The "everybody have fun tonight. Everybody...Wang Chung tonight" Frasier entrance still gets me every time, even all these years later.